This wonderful custom 1959 Vespa VNA belongs to our friend Paul, who owns FashioNation at 1594 S. Broadway. He’s been a lover and rider of scooters for decades but within the last 5 years, he’s decided to part ways with this beloved machine. As you can see, this Vespa isn’t like any other. It’s won multiple awards – it’s been featured in all sorts of printed magazines and blogs, as well as being showcased at the Denver Comic-Con multiple times. There is an extreme attention to detail throughout the entire scooter, with the brake levers being the only item not customized. Besides the paint job, rims, custom cut bat cowling and Cadillac tail light – there are many other unique items you’ll find on this wonderfully designed GoBat Vespa below. It has a price tag of $12,500 $8,000 and would be a perfect addition to the home of any scooterist, especially Batman fans. Police and bicyclists might frown upon it, but according to the Colorado revised statutes 42-2-103 it is in fact legal to ride a 50cc scooter in the bike lanes of Denver. What you cannot do is ride on the sidewalks or the cherry creek bike path so don’t get this law mixed up with what you WANT to do. The idea is all about traffic flow – if you are stuck in rush hour downtown and want to get in the bike lane to better ease through traffic, then you can do so. It’s not so you can speed around bicyclists, so don’t do that. It’s wise to keep a copy of these statutes under the seat of your scooter in case you ever get pulled over or harassed by anyone trying to tell you it’s illegal, which we’ve heard a few stories about. The primary riding season has come and gone in Colorado. Winter is upon us. But, as we all know, there will be plenty of days in the next few months when the sun shines and the mercury climbs over 55 degrees. We want to ride on days like that and that’s why scooterists in Colorado need not fully winterize their machines. Nah. We want to keep them at the ready. Still, there are a few basic things we should all do to keep our scoots primed through the winter. Prevent the battery from dying. Batteries are expensive. Furthermore, they cannot be discarded in the trash. Batteries must be recycled, otherwise they pose a threat to the environment. At Sportique we like to see as few replaced as possible. One thing we can assure you is that if you simply stash your scooter for the winter and pay no heed to the battery you will be replacing it in the spring. It will go bad. Batteries rely on their “memory” to stay vital. “Memory” refers to the effective capacity of the battery and that capacity dulls over time until the battery “forgets” that it’s a battery. Cold is especially damaging to the memory of a battery; therefore it’s very important to periodically charge it when temps plunge. We recommend the Battery Tender Junior ($40). It’s a smart charger that automatically switches itself on and off on demand. Stabilize the fuel. Picture a bottle of Italian salad dressing sitting on a shelf in your refrigerator. See how the dressing separates into layers, with the lightest material at the top and the heaviest at the bottom? Your fuel settles inside your scooter in the same way. Over time the heaviest material (which often contains sediments) will settle, causing fuel flow problems at the tank valve and inside the carburetor. The way to prevent this is to use a quality fuel stabilizer. Also, since we see a lot of ethanol in our fuels this time of year, you should use a treatment that consumes ethanol with enzymes. We recommend Startron enzyme additive ($9). One bottle treats 40 gallons of gasoline. Also, start your scooter periodically to keep the fuel system flowing. Air your tires. When that phantom 60 degree December day arises and you decide to run your scoot you should head straight for the gas station to return the tires to proper inflation (usually around 30psi). Fluctuating temps cause the air inside your tires to expand and contract, often forcing air out and causing your tires to be soft. It’s not only dangerous to ride on under-inflated tires, it leads to uneven and premature wear. A quick stop for a fill-up is all it takes to make sure your tires don’t leave you flat. Ride the poor thing every chance you get. The absolute best thing you can do for your dormant scooter is ride it. Even if you’re only comfortable putting around the neighborhood, start your scoot up and take it for a spin whenever the weather allows. This will keep your fuel system flowing, send a jolt to the battery through the charging system and in general allow the cobwebs to blow out. 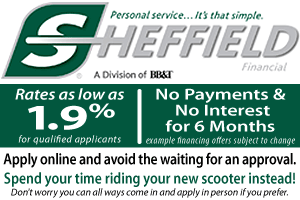 The more often you can get the scooter up to operating temperature through the winter months the less likely you are to need service in the Spring to make it ride again. Cover it, for heaven’s sake. If you absolutely cannot free up garage space for your scooter you should at least cover it up. Nice fitted scooter covers are available at Sportique for about $60. Or, as a cost-saving move you can purchase a barbeque grill cover at any hardware store that will do the same thing. Keep the snow, ice and water from directly contacting your machine and it will be far less susceptible to damage. The first day of winter isn’t until the 21st of December. With that said, we’ve had some extremely chilly days and evenings that sure have felt as if winter was already upon us. Denver experienced a tremendous autumn and riding hasn’t quite yet stopped for a lot of people. However, for those who don’t like braving the cold via two wheels all year round, there are some things you want to do for your machine before you putting it away in the garage for the next 3-4 months. Every Spring we see a lot of scooters coming in with what we call, “Sitting Disease”. It happens to the best of us – you’re riding your scooter one day but the snow hits the next. You have plans to take it out on the next nice day, but then seemingly out of nowhere, a few months go by and you’ve done nothing with the dusty scooter in the garage. Now the battery is dead, the carburetor is gummed up and the machine won’t start. A new battery can cost between $40-$70+ and a fuel system flush can be $135. A couple of things that can save you from said hassle is investing in a battery charger, like the Battery Tender Jr. Unlike a lot of battery chargers, this one charges and maintains your battery so you never have to worry about it. Most of the trickle chargers are meant to be on for no more than a couple of hours or damage can occur. A lot of people also only like to charge the battery once it’s dead, and if you’re going to do that – you might as well only put gas in your scooter once it dies on the side of the road.) It’s all preventative maintenance, if you catch my drift. The other thing you’ll need to do is keep a fuel stabilizer in your gas tank. We recommend Star Tron or Sta-Bil, which are both under $10 and each bottle will last you for hundreds of miles or keep on your shelf for years. Gas starts to go bad within a few weeks, and it’s always evaporating. These two things combined will gunk up any motor, especially in small engines such as the one in your scooter. Keeping an additive in your fuel will keep the fuel fresh for up to two years and prevents hard starting and build ups. Adding a fuel stabilizer will help keep the carburetor clean and make sure your bike starts up and runs smoothly whenever you decide to take it out for Spring or just a spin around the block! We hope this information provides you with a bit more insight and information on how to avoid poor running scooters and costly repairs. As always, if you ever have any questions about this or other topics, feel free to call us at any time! This years Monster Ride will be leaving Sportique Denver at 11:30am! Come prepaired for all kinds of weather, as this is Colorado. Also make sure you have a full gas tank for the ride. We’ll make a stop, but it won’t be right away. It should be lots of fun – we’re going North this time, through Riverdale Road and back through Thornton and Westminster. Let’s face it. Fees are lame. At Sportique Scooters the only fee a buyer will encounter is good old fashioned sales tax and we would eliminate that, too, if we could.